MACAU, Jun, 15 2018 - (Media OutReach) - Martial arts superstar Donnie Yen and actress / international supermodel Du Juan have teamed up with one of the world's most influential photographers, Nick Knight, for City of Dreams' stunning new brand campaign. Known for consistently challenging conventional notions of beauty in his ground-breaking creative collaborations with fashion icons and labels such as Kate Moss, Alexander McQueen and Comme des Garcons, Knight is a world renowned visionary as well as director of SHOWstudio.com. He was also the official portrait photographer for Queen Elizabeth and Prince Charles for the Queen's 90th birthday celebrations. This is the first time Knight has collaborated with a hospitality brand. The trailblazing campaign shot in the UK encapsulates the sensation of personal triumph that is synonymous with City of Dreams, through a creative concept featuring iconic portraits of key figures in history interpreted by Donnie Yen and Du Juan. The striking visuals combine elements of East and West, blending tradition with a modern twist to boldly personify power and heroism. The image of Donnie Yen is inspired by classical paintings of Napoleon Bonaparte, the 19th century Emperor of France, with the famed 'Napoleon at the Saint-Bernard Pass' by artist Jacques-Louis David depicting the Emperor in all his glory atop a white Arab stallion. 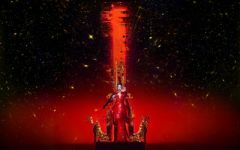 Du Juan plays an Empress dressed in a sophisticated China rouge gown sitting on a throne, radiating the spirit of power and victory. The key visual of Du Juan is inspired by the 15th century painting 'A Muse (Calliope?)' by Italian Renaissance artist Cosimo Tura. "It is always such a pleasure to work with talented and driven people, and to do so on the campaign for City of Dreams, home of the one of a kind Morpheus hotel, which is reshaping the concept of hospitality for the modern world, was doubly exciting," said Nick Knight. "The bold and revolutionary design by the revered Zaha Hadid served as a constant source of inspiration, while Donnie Yen and Du Juan are great actors, who worked really hard to bring the images to life." 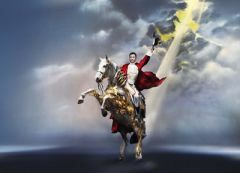 Donnie Yen added: "I am an experienced horse rider, however shooting this particular photo portraying Napoleon on a white horse was extra memorable. Donning the outfit and being on the dramatic set built by Nick's team, I was instantly transported to a world of grandeur." Du Juan said: "I am honored to be part of the 'dream' team behind this sensational shoot. I felt very confident sitting on the throne as the Empress, and am delighted with the results: the images are truly spectacular!" The cornerstone of City of Dreams' Phase III development and the world's first free-form exoskeleton-bound high-rise architectural composition, Morpheus hotel will be unveiled tomorrow, June 15. Known as 'The Icon of the New Macau', the architecturally unique masterpiece was designed by the late Dame Zaha Hadid DBE - the first woman ever to be awarded the prestigious Pritzker Architecture Prize. City of Dreams is an integrated entertainment resort that has established itself as a premier leisure and entertainment destination in Macau. Located in the heart of Cotai in Macau, it combines electrifying entertainment, a diverse array of accommodation, regional and international dining, designer brand shopping and a spacious and contemporary casino. The resort brings together a collection of world-renowned brands including Grand Hyatt and Dragone to create an exceptional entertainment experience that aims to appeal to a broad spectrum of visitors from around Asia and the world. City of Dreams features a 420,000-square-foot casino with approximately 475 gaming tables and approximately 670 gaming machines; over 20 restaurants and bars; an impressive array of some of the world's most sought-after retail brands; "The House of Dancing Water", the world's largest water-based extravaganza showcased in the purpose-built Dancing Water Theater, represents the live entertainment centerpiece of City of Dreams' overall leisure and entertainment offering. A comprehensive range of accommodation options at City of Dreams include Nuwa offering approximately 300 guest rooms, The Countdown offering approximately 300 guest rooms and Grand Hyatt Macau offering approximately 800 guest rooms. In addition, Morpheus, the new hotel at City of Dreams designed by the late legendary architect Dame Zaha Hadid, is expected to commence operation on June 15, 2018, offering approximately 770 rooms, suites and villas. For more information please visit: www.cityofdreamsmacau.com (Official Website) and www.cityofdreamsmedia.com (Media Portal). For The House of Dancing Water information, please visit www.thehouseofdancingwater.com (Official Website) and www.thehouseofdancingwatermedia.com (Media Portal). The image of Donnie Yen is inspired by classical paintings of Napoleon Bonaparte, the 19th-century Emperor of France, with the famed 'Napoleon at the Saint-Bernard Pass' by artist Jacques-Louis David depicting the Emperor in all his glory atop a white Arab stallion. Du Juan plays an Empress dressed in a sophisticated China rouge gown sitting on a throne, radiating the spirit of power and victory. The key visual is inspired by the 15th-century painting 'A Muse (Calliope?)' by Italian Renaissance artist Cosimo Tura.